Kuroiwa: "Hiranabe-san, what have you learned from TPS(Toyota Production System) ? What is it in one sentence?" Hiranabe: "Flow and Customer pull ?" Hiranabe: "Respect for People and Kaizen?" Kuroiwa: "Not bad. But what is it all about ? TPS keeps telling you just one thing. What is it ?" On Feb. 22nd, 2009, Mr. Satoshi Kuroiwa delivered a keynote speech at Agile Japan 2009. he built his career as an IT training manager of Toyota Motor Corporation. In the 1980’s, Toyota Production System was introduced to the factory of NUMMI, a joint venture company founded by Toyota and GM and he had been a manager there. In the factory, more emphasis was put on people and human capabilities than on high technology. At first, there were more than 200 job skills defined, but he reorganized them into only two rolls --assembly workers and maintenance/service workers-- to develop multi-skilled workers. Thanks to these improvements, the factory that had once been closed was successfully revived. Kuroiwa-san pointed out that excessively divided roles are distributed in the current software industry in a very funny process called "waterfall", and stated that higher efficiency would be achieved if workers gradually expanded their capabilities under shared goals instead of sticking on their segmented skills. He also pointed out that one of the most important Lean concepts was “customer pull”, which means in manufacturing to produce just what customers need. "But what does this mean in software development?" he asked the audience ... "Think for yourself. You are software engineers. In software development, it means that developers should understand the _why_ of the customer needs, instead of the _how_ of realizing the needs using technology." He concluded his speech by emphasizing that “Thinking for yourself in your context” is the heart of Lean, and ranted to the audience that they shouldn’t import anything without questioning why. A lot of software concepts have been imported from abroad and most Japanese software developers just use them without thinking. The problem to solve is always yours and you should think based on your context. "Think for yourself in you context"
That was the answer to the first question. As frequently stated, Toyota "makes things" and at the same time, "makes how to make things" i.e. process -- they produce 10,000,000 cars per year(lower this year) and at the same time, adopt 1,000,000 kaizen proposals from company members to improve the process in the factories. But it was not just that. They "make things", "make how to make things" i.e. process, and "make how to make how to make things" i.e. thinking people. Process is meta to product, and people is meta to process, and we are people making the product through the process. TPS is a "Thinking People System". During Toyota plant tours(you can apply via web), I saw a sign board in Motomachi plant where TPS stared, saying "Good Thinking, Good Product." This slogan is commonly seen in Toyota plants. 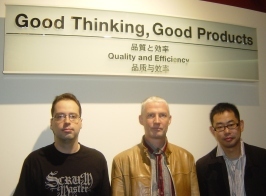 Here's a photo taken two years ago with Craig and Bas, under the sign of "Good Thinking, Good Product" when they came to Japan and met with Kuroiwa-san. Thank you for posting the article on phronetic leadership! This is the component I've always felt was missing from TQM, Lean, & Six Sigma. In the West, Phronesis (aka practical reason) was literally snuffed out around the time of the 'Enlightenment' and Episteme (aka science) became supreme. Professor Bent Flyvbjerg has been attempting to bring phronesis back into the social sciences because they don't fit the mold of the natural sciences. Phronesis has been the missing piece of the puzzle for over 300 years! Economists wonder why their economic models don't explain the crisis going on right now. Their mathematics and theories are out of step with reality. Phronesis will help get us back on track. The Japanese,the Europeans & Australians seem to get it. America hasn't got a clue. Jack Welch and the 'Boys' are living on outdated glory. You did a wonderful sulmiation with beads, dies, and cups, to understand and experience the advantage of pull over push. And also the bottle neck sulmiation using cards.Thank you!